This interview aired in on April 4, 2010 and November 22, 2010). It was transcribed by Ben Kennedy. Michelle Desilets, Executive Director of the Orangutan Land Trust, spoke with Laurel Neme on her “The WildLife” radio show and podcast about the process of rehabilitating orphaned orangutans and teaching them to be wild. This is the second in a two-part interview. The first part covered orangutan biology, habits and the interconnected threats, from the pet trade to habitat loss and expansion of oil palm plantations, facing these creatures. 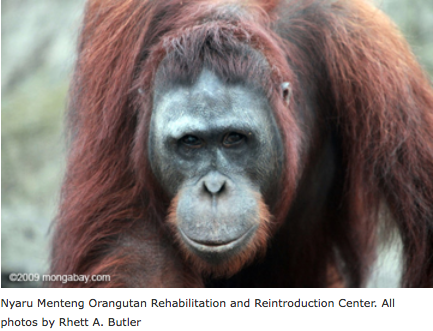 This second part focuses on what happens to surviving orangutans. The Nyaru Menteng Orangutan Rehabilitation and Reintroduction Center in Central Kalimantan, Indonesia received its first dozen orangutans in 1999 and now has over 600 orangutans in its care, making it the largest such center in the world. Its work has been featured in the United States on the Animal Planet series Orangutan Island, and also in the BBC program Orangutan Diary. 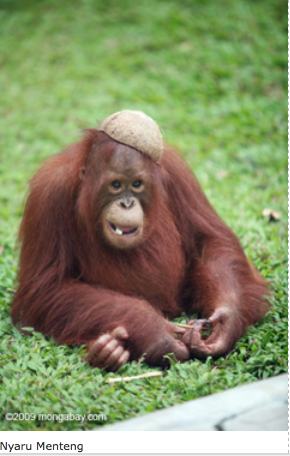 Did you know orphaned orangutans go to school to get the skills they need to survive in the wild? Just like for humans, in orangutan nursery school, the babies and toddlers focus on their gross motor skills by learning to climb. They practice and practice, but get upset when they’ve climbed up a tree and are afraid to climb down without help. When they’ve mastered the basics, they move on to elementary school, or Forest School One, where they gain more skills, such as finding food, building nests, and knowing what dangers to avoid, like snakes. 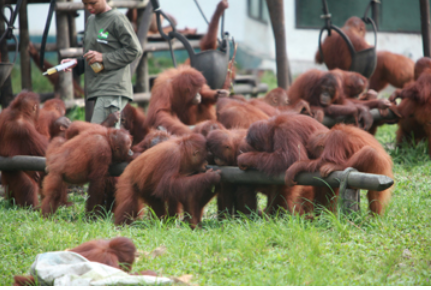 Forest School Two is similar to human high schools, where the orangutans become increasingly independent. Orangutan “university” is the next step, where the animals practice living on their own but are still supported if they get into trouble. In 1997, Michelle Desilets, together with Lone Dröscher Nielsen, began exploring the creation of a new project in Central Kalimantan to address the swelling numbers of orphaned orangutans and, in 1999, with assistance from Dr. Willie Smits and financial backing from the Gibbon Foundation and the Borneo Orangutan Survival Foundation (BOS) Indonesia, the Nyaru Menteng Orangutan Rehabilitation and Reintroduction Center was born. She’s long been committed to orangutan conservation. As founder and Executive Director of the Borneo Orangutan Survival Foundation UK, Michelle initiated a number of international campaigns to help orangutans, including campaigns to end the illegal trade of orangutans, to repatriate known smuggled orangutans, and a campaign for sustainable palm oil. She sits on several working groups in the Roundtable for Sustainable Palm Oil. She also founded and is the Executive Director of the Orangutan Land Trust (based in the United Kingdom), which supports the preservation, restoration and protection of land in areas where orangutans naturally exist or have existed in the past. The main aim of the Orangutan Land Trust is to ensure that safe forest areas are set aside for orangutans and other species to form a healthy ecosystem. 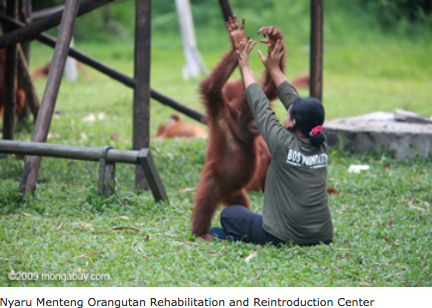 She spends a good deal of time at the Nyaru Menteng project, and provides this inside look at orangutan rehabilitation. The following is an excerpt from The WildLife with Laurel Neme, a program that probes the mysteries of the animal world through interviews with scientists and other wildlife investigators. The WildLife airs every Monday from 1-2 pm Eastern Standard Time on WOMM-LP, 105.9 FM in Burlington, Vermont. You can livestream it at www.theradiator.org or download the podcast from iTunes, www.laurelneme.com, or http://laurelneme.podbean.com. This interview aired in on April 12, 2010 and November 29, 2010. It was transcribed by Ben Kennedy. 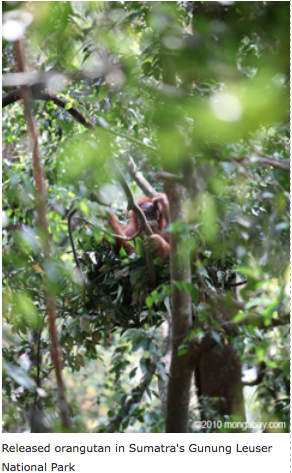 Laurel Neme: How does a rescued orangutan learn to be wild? Michelle Desilets: In the rehabilitation process we have several “schools.” If you can imagine a very young orangutan coming in who’s under one year of age, they start off in the nursery. The nursery is a very tiny, little forest with very tiny, skinny, little trees. The girls, we call them babysitters, local Dyak women who look after these orangutans, make little climbing frames about a foot or so off the ground, and they encourage the babies to learn to climb. Laurel Neme: How do they do that? Michelle Desilets: Babies learn to climb from side-to-side first—with a back-and-forth back-and-forth with their arms up on the branch and their feet sitting on the ground or two inches off the ground, and the babysitter sitting behind ready to catch them should they fall. The look of concentration, with their tongues sticking out of their mouths walking back and forth, is astounding. Then, eventually a few months in, they get their confidence. And they like to climb up. Not down. Just up. They’ll go up about 5 or 6 feet then look down and start to scream blue murder until some babysitter comes and picks them up and brings them back down for a little reassuring cuddle. Then they go straight back up again. 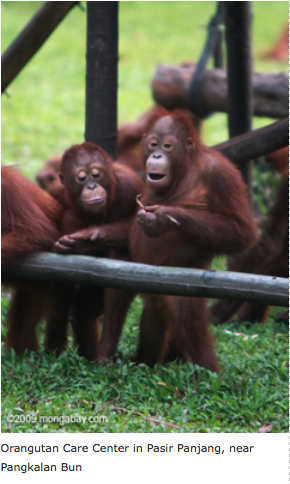 In both nursery and Forest School One, the orangutans are looked after by babysitters 24 hours a day. They're taken out to the forest first thing in the morning. They learn what they need to learn. And just before dusk they're brought back into wherever it is they're going to be sleeping. In some places it’s a nursery house. In other places, there are large social enclosures, and the babysitters will sleep with them. Laurel Neme: Do they sleep in beds or nests? Michelle Desilets: The smaller ones sleep in little laundry baskets filled with pillows and toys and blankets and sometimes leaves. The girls sleep with them. They get up every few hours and feed them and change their diapers. This goes on for a number of years. Laurel Neme: What is the training for the babysitters? Michelle Desilets: We started off in 1999 with a couple local women. We tried to train them about what we knew about looking after orangutans. That came from people like Lone Dröscher Nielsen, who runs the project, and her husband at the time, who was Mr. Odom, who was a Dyak and grew up in the forest and knew all of the foods and whatnot. Then these women pass on the skills to all the new women who come in. So they're trained on site by more senior staff. Often the women will come in having never seen an orangutan in their lives, or maybe only seeing one in a zoo or photograph or on television. I've seen them come in and be scared to death of a two-year-old orangutan, absolutely mortified, [wondering] is this one getting ready to bite me or pull my hair? After about three days, they realize which ones they need to be scared of. Laurel Neme: What happens in Forest School One? Michelle Desilets: Forest School One is a slightly bigger forest with slightly bigger trees. The orangutans are about one to three years of age. And, again, they’re going out to the forest in the day, and maybe have more guided lessons. We teach them how to find the right kinds of sticks and dig for termites, and where you might find termites, and how to find honey and get it out of holes with a stick. We have a lesson that we do, which causes a great deal of amusement amongst the staff (which kind of blows the whole thing), but you've got to teach orangutans to be afraid of snakes. Remember, orangutans are creatures that learn what they need to know. It's not instinct. That's what makes them a more intelligent species. Any species that spends a long time in schooling, a long time learning, has a capacity for learning and brain development that a species that relies on instinct doesn't have. Just think about your own children in school—the longer they go to school, the more intelligent they are. It's quite a long learning process. 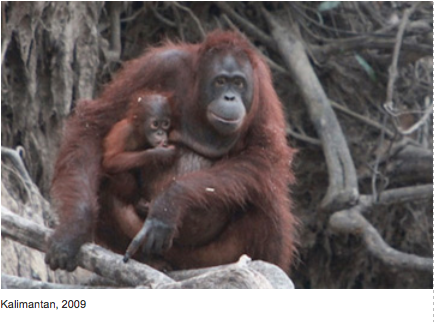 Laurel Neme: How do you teach an orangutan how to find sticks, or to find honey or to be scared of snakes? Laurel Neme: How about teaching them to be afraid of snakes? Michelle Desilets: Snakes is a great one. We've got these really realistic rubber snakes. We'll go out early in the morning, before the orangutans go out, and we'll surreptitiously hide it in the leaf matter or along a low lying branch along the path where we’ll be walking. Then we'll start walking in the forest with the orangutans, with the hope that one of the orangutans will notice. If they fail to notice, one of the babysitters will notice. Once it’s noticed, the babysitters will start making all kinds of mother orangutan noises like this (Desilets simulates noise), and grab up all the babies and go climbing up the trees. They'll take very big sticks and throw it at the snake and beat the snake, keeping their distance all the time and acting totally afraid. All the orangutans, their hair stands up on the end and their eyes go very wide and they go straddling up the trees, if they haven’t been picked up, and they learn, this is the reaction that you’re meant to have if you see one of these things: you get out of there and you throw things at it. But, invariably, there is one babysitter who is laughing the whole time. And, invariably, there is one orangutan who says "come on this is a bit of plastic or a bit of rubber" and picks it up and swings it around. “See this!” Sometimes the lesson doesn't work, but for the most part it does. We do nest building with them and we climb up the trees with them. We place out and provide and pluck plants that might provide food in the wild. Until they see their mother or their surrogate mother choose and consume a plant, they’re not really aware of whether it's something they can eat. Like a baby, they try a lot of things. So if they’re try something that's going to be toxic to them, we have to be very quick to pluck it out of their mouth and go “no, no, no, no, no” and make orangutan noises that say this is not one that you eat. Replicating an orangutan mother has its limitations. There is only so much you can do but we try our best. One of the best things we can do is to just provide these opportunities for learning. That takes years. Different things may happen different days. Different opportunities can crop up. Different species may come through the forest and they have to interact and know what to do. Laurel Neme: What is the curriculum of Forest School One? Michelle Desilets: Once they start to get a little bit older, they'll practice building nests but they'll still come in in the evening and sleep in these kind of community enclosures for a sense of security. This is where they sleep and this is where they'll get food for the night. But as they gain independence and they improve their skills in nest building, they'll build a nest later in the evening and they may stay up there when its time to go home. The babysitters will get very cross, calling "Come on down, come on down." But the orangutan will often stay in this nest, if they're quite independent. The staff will come in and say "Oh no, so-and-so is in the nest, what should we do?" and it’s the same [response] every time. We say "You'll have to go in the forest and sleep under the nest and make sure everything is okay." So, the babysitters go into the forest and sleep under the nest, because invariably, this orangutan wakes up at 9 or 10 or midnight and freaks out. "Oh my gosh, where am I? What am I doing here? Where is my warm friendly place with all my friends?" They'll start screaming and coming down and need to be reassured them and brought back to their proper bed and sleeping area. Eventually, they’ll stay all night. And, eventually in the daytime, these same orangutans, growing in confidence and independence, become very, very [naughty] and they start to pull at the hair of the babysitters, or bite them, or cause all kinds of grief. When the babysitters start to complain enough, we know these orangutans are ready for Forest School Two. Laurel Neme: What happens in Forest School Two? Michelle Desilets: Forest School Two is like high school. It's another location. It’s another patch of forest. It's a bigger forest with bigger trees and, importantly, no more babysitters. No more women. Now we’ve got men. These men, who we call “technisse,” are very serious indeed. You're not going to get cuddles from these guys. Well, maybe from one or two. One or two become known as the softies, and if an orangutan gets thumped by his best friend or stung by a bee or something, you can go to [them and] get a reassuring cuddle and feel safe. But, generally speaking, these guys are not cuddly things, and that encourages independence that much further. These orangutans are, for the most part, sleeping out in their nest through the night. You don't need to camp out underneath them. They're learning so many more skills, usually from one another. This will go on for another three years. [So, now they’re] three to six years old. Laurel Neme: How do you know when they're ready to move on? Michelle Desilets: Usually one of the indicators at the upper end of the schooling is that they go “walkabout.” They go wandering a bit to far for their own good. This forest is only a certain area of forest. Beyond that, there is some human development. So, for their safety, and for the safety of adjoining communities, if they’re wandering so far that they’re coming into contact, we'll be bringing them back and have to find another solution. Laurel Neme: What’s the next solution? 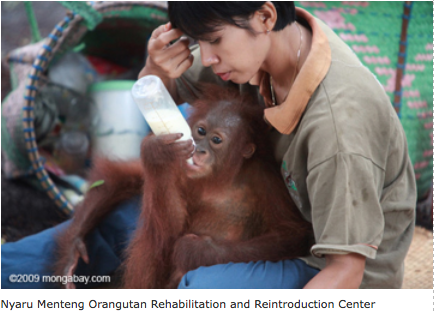 Michelle Desilets: The next solution is the orangutan university: the islands. We have five islands. They’re river islands, surrounded by water. 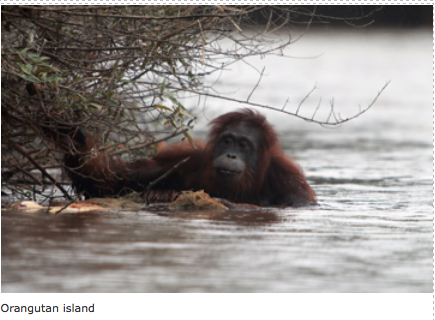 Orangutans can’t swim, so the water provides a barrier system to keep them safe and keep them on the islands. We put them on the island and there, just like a university, they're meant to show us that they can act as adults and get by in the real world. But just like college for humans, if something goes terribly wrong and they make a complete mess of things, someone is going to come in and save the day. Human kids call mom and dad, and usually they'll get bailed out of whatever they've gotten themselves into trouble for. [When] the orangutans have some problem, like getting bullied or not thriving or getting sick, we intervene and help them on their way. They'll get provisional feedings. They’re mostly looking for food out in their environment, but to make sure they're fat and healthy and getting all the nutrition they need, we do provide additional food on feeding platforms. Laurel Neme: Are humans living on the islands? Michelle Desilets: Humans do not live on the islands but our staff [go out there for] two feedings a day. They circumnavigate these islands in boats and are meant to spot each orangutan within every 24 hours. If they report that they haven't seen one, say, Hamlet, then at means we have to search for Hamlet. We have to make sure nothing happens to them. Laurel Neme: How do you do that? Michelle Desilets: We'll send a team of people out there to go look for Hamlet and make sure he hasn't become ill or had an injury or been bitten by a snake. So we can intervene quite quickly. 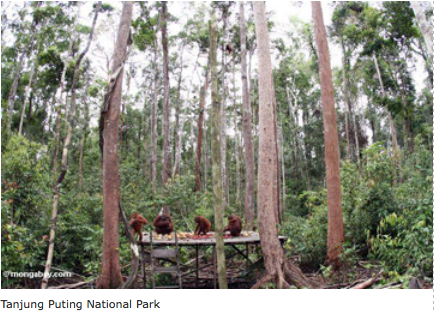 Laurel Neme: How long do the orangutans stay on the island? Michelle Desilets: [They spend] a couple of years on the island, showing us they can do these things. Then it’s time for release. Laurel Neme: How will the release work? 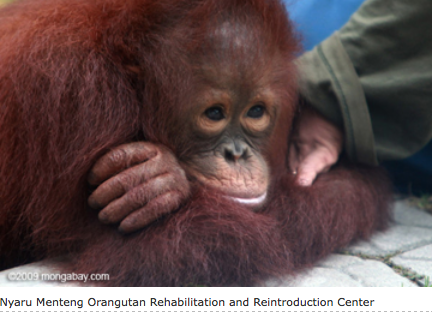 Michelle Desilets: This year [will be] the first time that we’ll be releasing rehabilitating orangutans. It's very exciting for everyone. Picture this small center opening in 1999 , with or a dozen baby orangutans. 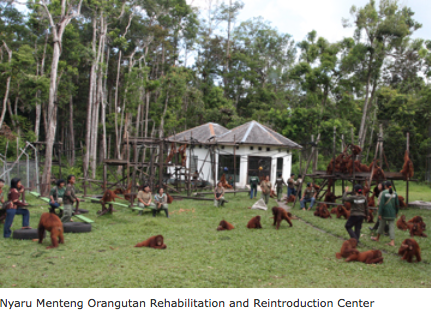 Now, just 10+ years later, 600 orangutans are at the center, with a few hundred ready for release after having gone through 7, 8, 9, 10 years of training. They're ready to go off to the big bad world and be released. It's taken almost as long as that to find a suitable release site and to secure it—to make sure that it's not going to be sold for logging or mining or palm oil, and that the government is going to work with us to keep these orangutans safe indefinitely, and that’s far from communities where there is going be any human-wildlife conflict. Laurel Neme: What will happen when the releases start? Michelle Desilets: [When we release them] we'll tranquilize these orangutans at the project, put them in these large, light transport cages that [will be] slung under helicopters and taken to their destination and released. Now, that’s not the end of the line. We're still going to watch them. 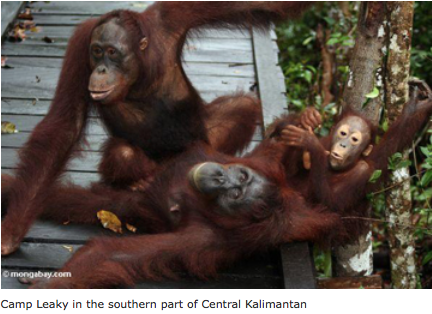 Laurel Neme: How will you continue to keep tabs on the released orangutans? 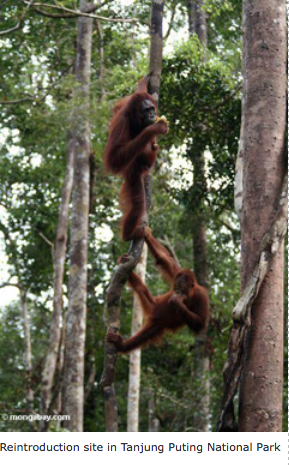 Michelle Desilets: These orangutans will be the first orangutans to have a tracking device on them. You can't really put a collar on orangutans because they've got no necks. They've got these huge throat pouches. When they shrug, the collars would come off. A company has developed a subcutaneous tracking device that will allow us to track their movements either from the ground or the air from quite some distance and will last for two years. We'll match this with visual tracking from people on the ground—staff that are going to be watching and seeing that they're staying fat and healthy and behaving properly. We have high hopes for a very successful rate of survival for this very developed and thorough rehabilitation process and the consideration taken into the qualification for release: the qualification for land into which they’re being released (that’s going to provide enough food sources and that’s safe); and also the qualifications of the orangutans that are going up, that they've demonstrated they can live independently, that they can choose the right food sources, they know what threat to stay away from, such as snakes, and they're healthy. Laurel Neme: What do you hope the end result will be? Michelle Desilets: By doing this, we'll actually be creating two or three viable populations in a protected forest. It's not just a welfare issue. It's not just doing it for the sake of these individuals [because] they have a right to live in the wild and to live healthy and free. But it is contributing to their conservation. [It’s] not only creating viable populations but, by virtue of these orangutans being in the forest, these forests and all the species that share these forests will be protected. Laurel Neme: Is this the largest primate rescue project in the world? Michelle Desilets: Yes. The Nyaru Menteng project on it's own is the largest rescue project, in the sense that it has the largest number of primates that its currently looking after—over 600. The Borneo Orangutan Survival (BOS) in Indonesia has another project in East Kalimantan that has about 225 orangutans and about 50 sun bears. It's also the site of Willie Smits’ groundbreaking efforts to reforest a wasteland [Samboja Lestari Reforestation Project]. Close to 2,000 hectares (or 5,000 acres) of complete wasteland he has successfully reforested with some 1,800 species of plants, and [it’s] brought back a great deal of the natural biodiversity—insects, bird life and even mammals—into this region. It’s changed the hydrology and precipitation. It's an incredible model for what can be done in reforestation and will serve as a small but meaningful refuge for wildlife. At the same time, Borneo Orangutan Survival (BOS) also protects huge areas of forest containing wild orangutans, [such as] the Mawas Reserve, which has about 0.5 million acres of forest in Central Kalimantan and is home to 3,500 wild orangutans. Some people ask "How long before the orangutan is extinct in the wild?" Even experts will say 2 years, 5 years, or 10 years before it's widely extinct. [They say] there will be some pockets here and there but that they’ll be in such small numbers that they won't be genetically viable in the long term. But I disagree with that because we already protect viable populations—populations over 3,000 will be hugely viable so long as we continue to protect these areas. That requires money and political will. Then, the species will not go extinct in the wild. But is that good enough? Say we save 3,000, or even 6,000, wild orangutans, you've got to figure about 4,000 or more are going to die these unnecessary and horrific deaths I've described, from lingering starvation or human-wildlife conflict. Morally that can't be right and we need to do something about that. Laurel Neme: When you release the animals for the first time, how many will you be releasing? Michelle Desilets: I don’t know. I haven't gotten the details from our team who are working day and night on logistics. We’ll release a handful at a time at several locations. A group of orangutans that we know get along and learn from each other and so forth will be released in one location and watched. 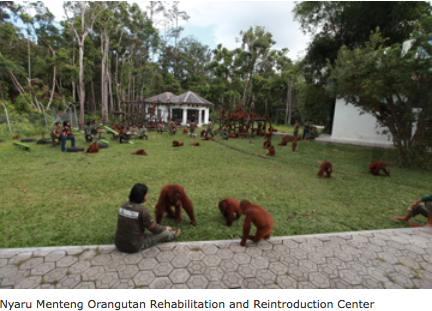 Then as finances and logistics permit, release another set of orangutans at another location. 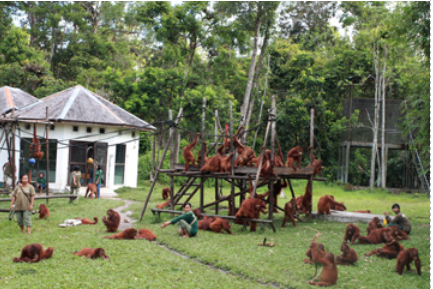 The target is over a hundred orangutans to be released.